Hours of operation/Seasonal Hours: Wednesday – Thursday Overlook: 9 a.m. – 8 p.m. Lagoon: 10 a.m. – 7 p.m. Friday – Sunday Overlook: 8 a.m. – 8 p.m. Lagoon: 9 a.m. – 7 p.m. Blue Prairie: 11a.m. – 8p.m. Open through January 2, 2018 with the following closures for routine training and maintenance, or holidays. Closed Thanksgiving Day, December 24 (Christmas Eve), December 25 (Christmas Day) Closed Mondays and Tuesdays in November and December except during major holiday weeks. Monday – Thursday Overlook: 9 a.m. – 8 p.m. Lagoon: 10 a.m. – 7 p.m. Juice Bar: 9 a.m. – 2 p.m. Friday – Sunday Overlook: 8 a.m. – 8 p.m. Lagoon: 9 a.m. – 7 p.m. Juice Bar (Friday): 9 a.m. – 2 p.m. Juice Bar (Sat. & Sun. ): 8 a.m. – 5 p.m.
Price Breakdown: Surf Passes range from $50 to $90 for a session just under an hour in the lagoon. Coaching sessions and clinics range from $85 to $190 with 30 minutes of dry land training and a session just under an hour in the lagoon. Surf Passes and training sessions include a softboard. High performance demo boards may also be rented for $25. For non-surfers, Shore Passes are just $5. Hours of operation/Seasonal Hours: Summer: 09h00 - 18h00 Summer (September to April) Gates open at 09h00 and close at 17h00. Water features shut down at 17h30. Winter: 10h00 - 17h00 Winter (May to August) Gates open at 10h00 and close at 16h00. Water features shut down at 16h30. The Valley of Waves closes for a month between May and July for annual maintenance. The Valley of Waves may be closed or close early due to private functions on an ad-hoc basis. Hours of operation/Seasonal Hours and Prices Season is from March to December. Prices are listed for Peak and Off-Peak prices. Peak prices apply from Friday morning until Sunday 4pm, bank holidays and school holidays. Off-Peak prices apply at all other times (including Sunday from 4pm excl bank holidays). Beginner £35-£40, Intermediate £35-£45, Advanced £45-£50. Equipment rentals available from wetsuits to Firewire Surfboards. Atmosphere: Quiet and relaxed. Family environment. Price Breakdown: $165 for lessons. No price listed for free surf. Park admission is $65 for 1-day pass. There are surf lessons before the park opens and after it closes. Space is extremely limited but you can make surfing reservations online at the link below. Each 3-hour session comes with 100 waves - broken into sets of 25. The renter gets to choose the wave settings.. The Lowdown: The wave made famous in Dion Agius’ “Electric Blue Heaven” clip is accessible and surf-able now. It’s a steep right or left off a wall that weakens a bit as it spreads out to centre pool. Price Breakdown: Prices: $18 park entry then $48 for each one-hour surf session. Six surfers maximum per session. Each surfer gets about six waves in the 60 minute session that is split with half rights and half lefts.
. Private session - private rental of the pool including personalised wave settings $400. Semi Private session - private access to the advanced wave but not the near shore beginner waves $275. Atmosphere: With Barton Lynch and Occy as ambassadors the finished project is more sport-focused than party-focused. Accessibility: Open to the public, All-ages, Beginning surfer, Intermediate surfer, Advanced surfer, Reservations, waivers and showing up an hour before your session are required. Atmosphere: Barbecue and cable park vibes. 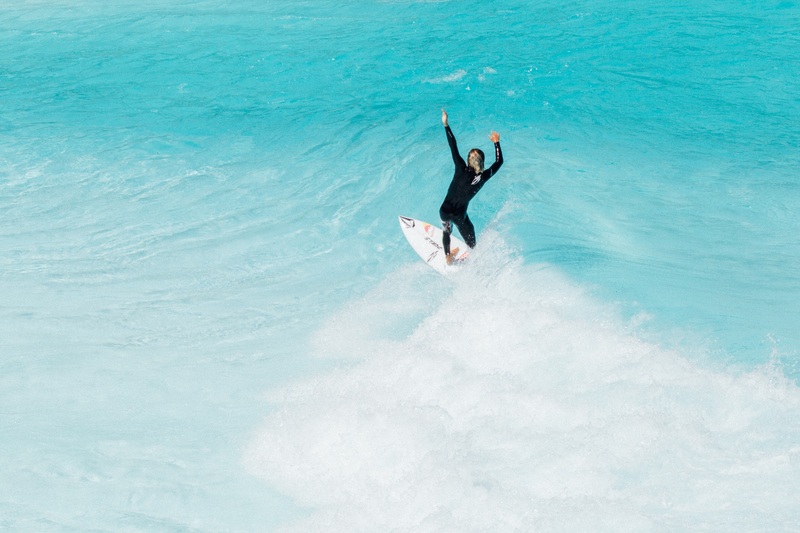 The Lowdown: 14 kilometres west of Sydney’s downtown and one kilometre from the central train station, the park will use Wavegarden Cove technology. Of interest, it will be built with a north-south lagoon orientation to suit prevailing wind conditions. LED lagoon lighting means night and day surf options. The Lowdown: Will be located nine kilometres south of downtown Perth next to the Swan River, at Tompkins Park, a significant 22 hectare sports precinct within the City of Melville. Hours of operation/Seasonal Hours: Wave pool is open to surfing from 6pm-7pm weekends and holidays and by reservation only. The Lowdown: This location is another in a long line of projects in the planning stages. We will keep you updated on this planned Wavegarden Cove project as information comes through. Accessibility: Not yet built or even open to the public. Type of wave(s): The cove produces everything from gentle knee-high rollers to head-high slabs via their top-secret machinery. The Lowdown: This location is another in a long line of projects in the planning stages. Tartan Leisure Limited owns the Wavegarden Cove rights in Scotland. They plan to develop, construct and manage the project in Edinburgh. Set to open near Ratho, in summer 2020, the Edinburgh International Climbing Arena will share the space. The Lowdown: The Wave Bristol has broken ground and will be building it's Wavegarden Cove facility in the coming months. We'll keep you posted on an upcoming launch date. The Lowdown: This planned Wavegarden Cove project will sit close to the wave rich beaches of Lacanau, just outside of Bordeaux. More info as it pops up. The Lowdown: This location is said to be part of an urban renewal project with eyes on the 2024 games. Will it host Olympic surfing? We'll keep you posted.. The Lowdown: Top secret and under wraps wave pool by Cheyne Magnusson. We will provide more details as information comes through. Type of wave(s): Knowing Cheyne's penchant for ramps and wedges, expect something similar to the American Wave Machines' technology in Waco. Wave's Technical Information: The lagoon and wave driver are both very large. No confirmed details on size yet. The Lowdown: Ambitious Wave Pool project planning enviro schools, a quarter of a million entrants each year and to-be-determined wave pool technology. Type of wave(s): At this point it’s undetermined which technology the WaveUp project will use. Wave's Technical Information: Since there is no wave technology selected yet, we don’t know if it will be Surf Lakes’ 5Waves design, Wavegarden Cove, American Wave Machines or a homespun tech such Cheyne Magnussen’s Palm Springs project. Hours of operation/Seasonal Hours: The investor brochures state an operating season of 10 months out of the year. Price Breakdown: Dynamic price system (high/low season) but the average will be 65 Swiss francs for one hour A Swiss franc is very to close to the US dollar in exchange at time of this writing. Wave's Technical Information: The indoor wave is being promoted as the largest in Europe with 0.20m and 1.00m “tubing” waves. The outdoor surf will be 1.00m to 1.20m in a peak or wedge and a wave for beginners from 0.50m to 1.00m. Rides will be 10-20 seconds long. Hours of operation/Seasonal Hours: Surf sessions are 1 hour 20 minutes. Price Breakdown: As yet priced “all inclusive” entrance fee and family, group and youth price structures. Not much is known about this project other than Kelly's announcement to the world via social media: “Well…it’s official…we have a building permit in Palm Beach County for #SurfRanchFlorida. I’m beyond proud and stoked to see the first of our developments at @kswaveco going to my home state of #Florida. The Kelly Slater Wave Co and WSL are building a facility in Japan. It's often said to be in Tokyo, but rumors point to Kisarazu in teh Chiba Prefecture. The Lowdown: This project will be the first Surfing Wave Pool in Scandinavia. An Indoor facility that will allow year round access for surfing and other water activities. The project is also seeking to build one of the most Eco-friendly Sport Facilities in Scandinavia. Price Breakdown: Not ready yet. The Lowdown: What the waves lack in quality the pool makes up for as an institutional landmark. The fictional character Rick Kane learned to surf here in the 1980s cult classic “The North Shore”. This was surfing’s first glance at wave pools. And while it never made a magazine cover, it stoked a crew of core area wave pool surfers with season passes. Wave's Technical Information: Wave height: 2-4 ft, Both Left and Right Breaks after a giant closeout. Length of Wave: roughly 30 yards/meters. The wave comes through about every four minutes and riders are required to wait their turn. Hours of operation/Seasonal Hours: May - September including some holidays. Surfing is open Mon-Sat 9-10am and 5-6pm with some Sundays. Price Breakdown: $349.95 for a season surf pass. Price grants access to Waikiki Beach Wave Pool for each evening session. If you want the morning session it’ll set you back $5 for each surf (in addition to the season pass). Season surf pass available for ages 13 and up. Apparel: Bikini, Boardshorts (Arizona summer temps are in the 100s almost each day.